I’m not a real Star Trek fanatic, let alone a “Trekkie”. In the seventies I always watched “Star trek” series on the television (they look old-fashioned and outdated now) and so I know all the characters and facts of “Star Trek” such as Kirk, Spock, Scotty, Bones, Sulu, Chekov, the enterprise etc. etc. I’ve heard the sentence “Space .. the final frontier …” so often in my life. And the fact that the Enterprise flew from one planet to another so they could discover new civilizations, was the common thread in the TV series. This was actually the first motion picture of “Star Trek” I watched. To my surprise this is already the 12th movie. The discovery of new civilizations is limited to the opening scene. The rest of the film is a succession of lightning fast action. The original Spock will always go down in history as “THE” Spock (Surprisingly he showed up in this movie as well). Zachary Quinto’s performance is great in terms of portraying the personality of Spock. In terms of appearance, however, it’s a different matter. He doesn’t have that radiance of an unworldly person who thinks that human logic is complicated and confusing. Though the total absence of human feelings was perfectly portrayed. Personally I thought that the moment Spock shows emotions, was a beautiful scene. CGI and special effects are breathtaking. Especially in comparison with the original series (Self-evident of course). The humor for me was terribly annoying and felt forced at certain times. Apart from the disagreement between Kirk and Scotty, with Scotty getting angry in a well-known Irish way. That was another chuckle moment. The rest was just a straightforward action picture with a SF sauce over it. Something that fits in the list “Star Wars” and “Batllestar Gallactica”, infused with all the ingredients of a superhero movie such as “Iron Man” and “The Avengers”. The fact that the superior blood of Kahn would save Kirk’s life, was a bit predictable. I’m not going to use the term unrealistic or implausible. That is why it’s an SF. All in all it’s an entertaining film for a Saturday night. Effective and masterful effects. 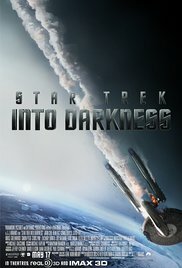 However, it is not a film that will incite me to watch all the other “Star Trek” films.